The Medical-Industrial Radiation Facility (MIRF) located in the Radiation Physics Division of the NIST Physical Measurement Laboratory is a user facility for the medical and industrial radiation communities. The MIRF is based on a re-configured rf-powered, traveling-wave electron linac donated by the Radiation Therapy Center of Yale University-New Haven Hospital. The accelerator provides electron energies from 7 MeV to 32 MeV at an average beam current of up to 0.1 mA. In addition, bremsstrahlung generated photon beams are also provided by the bombardment of suitable targets. Medical linacs are used for treating 500,000 cancer patients annually in 1325 treatment facilities in the United States. The Sagattaire linac used in the MIRF is designed for electron beams with energies from 7 MeV to 32 MeV, in increments of 3 MeV. It is also equipped with a target for 25 MeV bremsstrahlung. The medical dosimetry applications of the MIRF relate to development and testing of instruments and dosimetry systems for use in the clinical facilities. 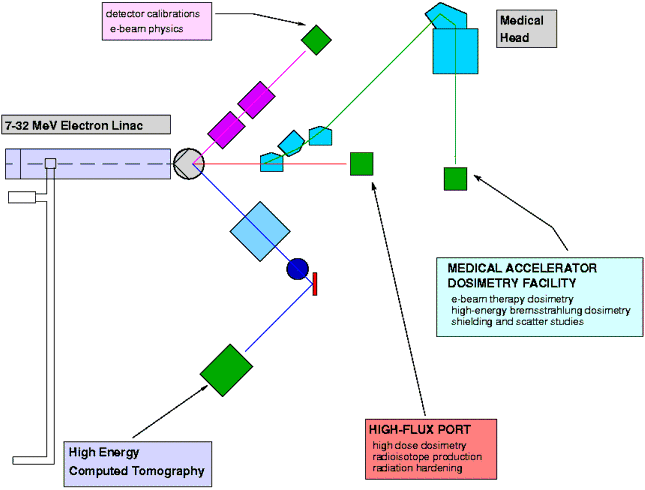 These dosimetry systems include traditional ionization chambers and calorimeters, and also passive dosimeters using radiochromic film, electron paramagnetic resonance, and thermoluminescent detectors. 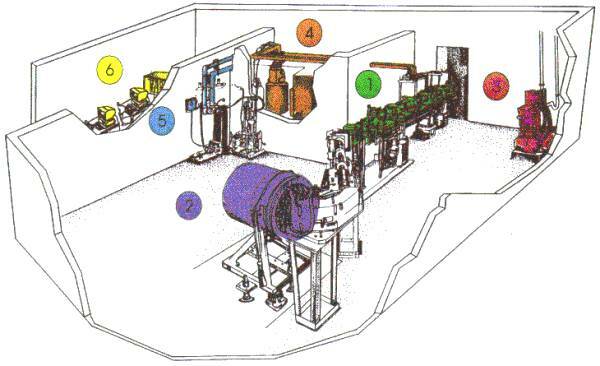 The MIRF also offers unique opportunities for industrial research and a number of companies and consortia are planning accelerator irradiations. A high- intensity beam line has been constructed that provides dose rates as high as kilogray per second. High dose applications of accelerators include polymer curing, radiation sterilization of products, disinfection of wastes, and hardness testing of electronics. The MIRF is available for proprietary use by industry in developing new applications, and is particularly useful where flexibility is needed in selecting beam energy, spot size, and processing rates. It can also be used to test real-time dosimetry systems for use in industry. Other unique capabilities of the NIST laboratories are available for industrial researchers. These include state of the art dosimetry systems (ionometric, radiochromic, EPR) as well as theoretical dosimetry expertise to aid in experiment design and optimization. Medium-energy accelerators are under investigation for production of channeling radiation and coherent bremsstrahlung. These experiments require tight controls on beam parameters (beam energy, current, emittance, spot size). Radiation physicists from universities, other federal laboratories, and companies in the Washington, DC area are participating in early work at the MIRF to construct and characterize a beam-line for use in accelerator physics studies. The completed MIRF accelerator physics beam line will offer unique opportunities for studies in surface science, microlithography, and medical diagnostics.